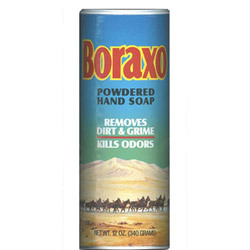 Boraxo is a unique American brand of hand soap comprised mostly of borax, and is favored by mechanics worldwide as the most effective hand soap available. They were the first company to combine mined borax crystals with soap to produce a natural and effective hand cleaner. The powder foams when mixed with water and the borax granules work hard to remove the toughest dirt such as oil, grease, tar, glue, and any other sticky situation you may encounter on the job.